This rental has everything you will need for a great vacation. 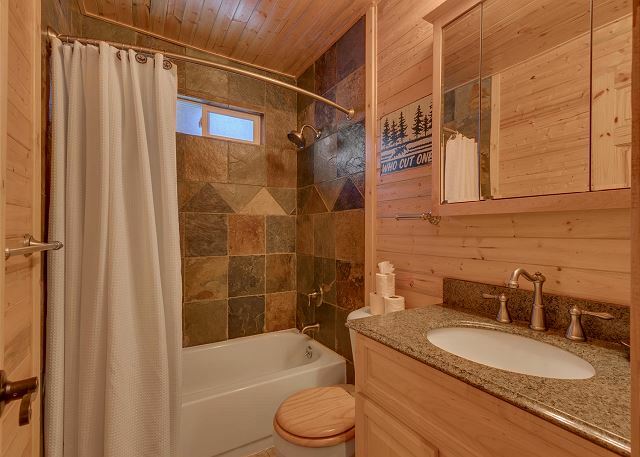 It has a great cabin feel with all wood trimmings and a great hot tub to relax after a great day on the slopes or the beach. In a quiet woodsy neighborhood but still close to town and the lake. 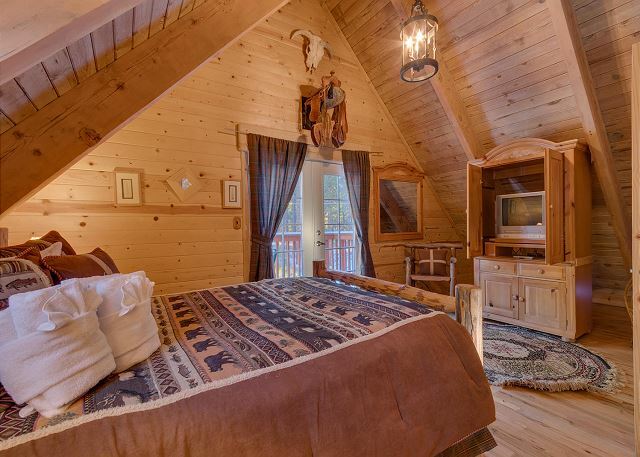 You will feel right at home in this cute cabin. This cabin does not have a garage. Upstairs is the master bedroom with a queen. There is a full shared bathroom in the hallway. 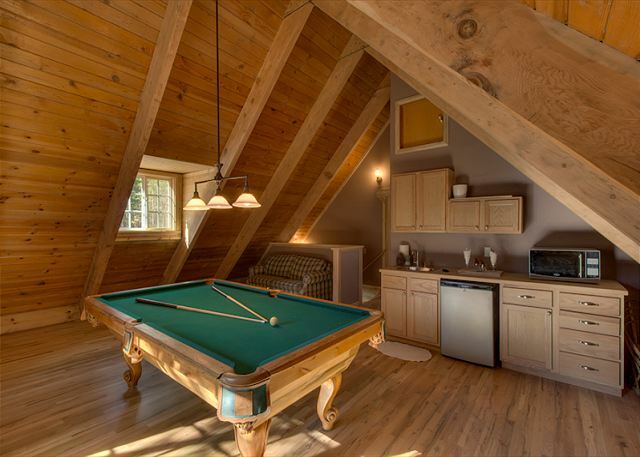 Upstairs is also the pool table room. 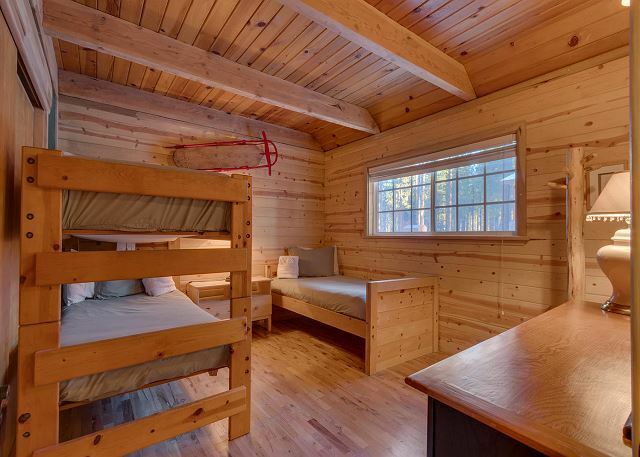 Downstairs is bedroom 2 with a queen, bedroom 3 with twin bunk beds & separate twin bed. There is a full shared bathroom in the hallway. The hot tub and BBQ are on a deck off the kitchen. 2. You are only allowed 10 persons at any time at the house. This includes any dinners or gatherings you may have. There is only sleeping for 7. Rooms Sleeps 10, 1)queen 2)queen 3)3 twins (one bunk and a separate twin) There is only sleeping for 7 in beds. Great house, in a great location! Management company was super helpful and available for any additional questions we had! The house was a true winter cabin that comfortably hosted 8 of us! Great service and stay all around! a guest from Shingle Springs, CA does not recommend this vacation rental. The overall ambience was pleasant. However there is a lack of heat upstairs especially in the master bedroom. There was only a blanket on the bed and we were so cold after the first night that we had to sleep downstairs on the sofas. The pillows on the master bed really need to be replaced. They were very hard and left us both with stiff necks after just one night. And a down comforter for warmth would be nice. The stuffing was falling out of the furniture upstairs in the game room. Maybe a couple of upgrades would show that the owners care enough to make it a comfortable experience for their guests. The open shed filled with junk that seemed to be falling down outside of the sliding glass doors in the kitchen area was not the prettiest view. It just felt like overall there could be some basic and really simple improvements that could have made that pretty house more desirable to stay in. The owner of the house has added a child safe space heater and more blankets to the house. The owner will also be adding new couches to the house. Thank you for staying with us and thank you for the feedback. a guest from Santa Rosa, CA does not recommend this vacation rental. Refrigerator did not work well so we ended up getting ice and putting our food in the cooler and the hot tub would not exceed 95 degrees so after 10 minutes it felt lukewarm. Good location to the beach (within walking distance), plenty of space, hot tub and pool table were very entertaining to have, house was great! The place was beautiful, but a lot of things were broken and I had to call and have the maintenance man come out. the place needs some attention, but still lovely. The things we had to deal with were, the door knob in the downstairs room would not stay on, the bathroom faucet handle came off, and we called about a leak in the ceiling coming from we don't know where, the fridge wasn't very cold and the veggie drawer was broken.. and upstairs there was a stool that came apart when sat in.. it was just a lot to deal with. The bunk beds were squeaky too. I would stay again if they just went through and fixed things.. because it was nice. Thank you for booking this house. All items are being looked at and will be fixed if needed. We hope to see you again. Cute little cabin on the edge of a wooded area. Couple miles from the beach but definitely a quiet relaxing area to stay. Our second time staying at this cabin, and it was great. Clean, new bedding this time, loved the private hot tub, bbqed every night, close to town but still have the feeling of being in the mountains, easy to get to with icy roads. Will be back for sure!! Kellie O from Martinez, CA does not recommend this vacation rental. House in good location. Floors were filthy not swept or mopped in a long time. Feet black after 5 steps! Spent the first night cleaning. All pools sticks broken. Furniture really run down and soiled! Hot tub was set to sleep mode so could not use. Dishes dirty so we had to rewash all before use. No like size/shape glasses. This is a house more for a frat party environment where cleanliness matters and not adult enjoyment. Management company was useless but friendly. Wont stay here again. Good experience. The cabin was very nice and homey. The only problems I saw were the upstairs bathroom which had part of the ceiling protruding out in the shower. That made it difficult to shower without hitting your head. The attic was also extremely cold and the heater didn't seem to warm it up. Some of the kitchenware was also not as clean. I found some dishes that had some left over gunk from a previous stay on it. Easy to rewash, but also easy to miss. We had a great time staying here. House had everything you would expect. Only down side is the upstairs can be a little cold. Other then that I would stay here again. Cabin was perfect, the kitchen was big enough to make a thanksgiving dinner without feeling cramped. The pool table was a nice addition, hot tub was decent (could be hotter), location is only 7 minutes away from heavenly ski resort. Definitely would stay again. 5 stars, only thing the guy might come off as rude But if you look past that, the place is definitely worth it. Overall, the home was great!!! It was as described. It was clean upon arrival. Checking in and out was very easy. Everyone was able to have a great time. Our guests appreciated the wifi. I would add that (like others have stated in previous comments) the upstairs pool room needs a fan. It didn't not cool off until after dark making it unusable during the day. A toaster would've been nice as well. We will definitely rent again. Thank you for having a lovely and reasonably priced rental for our fun trip! We had a great time at the Lodge - the house was beautiful. Some amenities did not work like the toaster and the dvd player in the living room, but otherwise, everything was just right. Wonderful weekend in the Tahoe Snow and Elkhorn Cabin!! 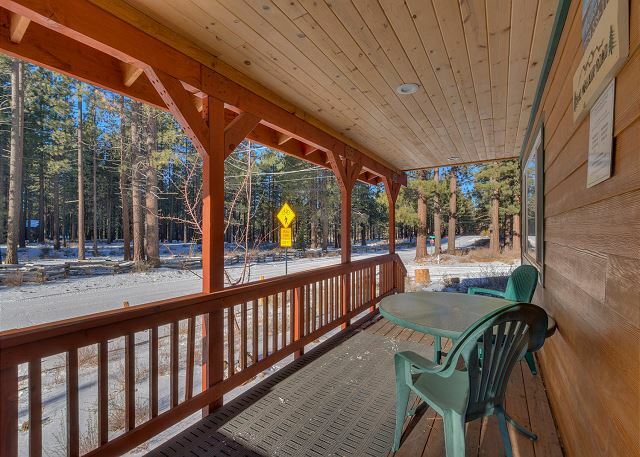 PROS: Great location not far from shopping centers, heavenly, and the casinos. The Cabin looked amazing with a fresh blanket of snow upon our arrival. The inside decor had the rustic cabin feel just like the pictures imply. The kitchen was spacious. All amenities were in good order and the hot tub provided hot steamy relaxation after a long snowy drive to South Lake! Bedding was comfortable and clean and plenty of towels were available, neatly folded for the guests. The pool and game room upstairs is a nice touch for entertainment. CONS: The fireplace is a useful feature but note that the fireplace is not gas like the BBQ, and we did not find any wood available for burning during our stay. So do bring wood for a fire if so desired. Front and back entry and porches were covered with several inches of snow on and no tools available for clearing. during or after snowstorms. Only the driveway was actively cleared of snow during our stay. Some sort of window coverings would be nice in the upstairs bedroom and game room windows, and the downstairs sliding door. There were mice. 2/3 times I calle de fhe perosn on the phone was really rude. The hot tube it's lukewarm at best. Aside from the mice. The property was nice. It was clean, but we spotted mice within the first five minutes we were there in the upstairs. I'm just gonna say this again. Mice. Rodents. Yes there were mice that day you checked in. In Tahoe, the mountains and wilderness area, we do get animals of any sort that are trying to find shelter during blizzard conditions. When it snows heavily the little animals do anything to find shelter. We sent someone over right away to set traps and try and get them out. This is just something that happens once in a great while in Tahoe during heavy snow. We did explain this on the phone when you called. One of the best cabins !! This has got to be one of the best experience I've had with renting a cabin for vacation . Check in was very smooth and so was check out. The place is clean and has so many amenities such as spa and a pool table. This place is beautiful and spacious. I'd definitely go there again. This was a beautiful home! We were so happy with the all of the accommodation! There were 5 of us who stayed here and it was very comfortable. The feel of this home has a great Tahoe and cabin feel. We had a lovely stay! I rented the house for my bff's bachelorette party weekend. The house is gorgeous & all the supplies needed (towels, tissue & all the kitchen fixings) were amazing! They thought of everything, even spices ! Ended up hanging out BBQ'n & jacuzzi all day one day. Very relaxing! Couldn't have asked for a more perfect weekend! My family had a wonderful time in this cabin! It was clean and had everything we needed. We will be renting this cabin again! Thank you for renting from us. We are glad you enjoyed the cabin. Hope to see you again. House was great and we had a great time! We had everything we needed. Only thing I recommend is some fans for upstairs because it gets a little warm up there. My family of 6 stayed in the Elkhorn Lodge property over a weekend in March during Spring Break. 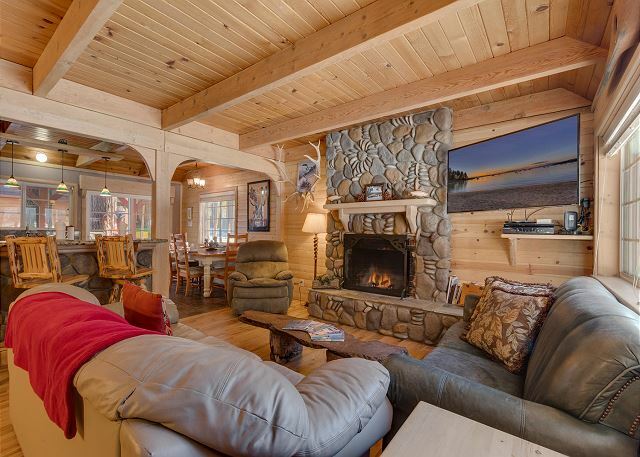 The home was really cozy, clean, beautiful, outfitted with all basic necessities and conveniently located about 1.5-2 miles from Heavenly mountain. I'd definitely recommend staying here! My family had the best time at the Elk horn lodge in Tahoe. We played pool and relaxed in the jacuzzi everyday and we're very close to town. It was storming out and we had the most beautiful scenery. We would definitely make this a yearly trip. started off on the wrong foot with a computer glitch setting my reservation for the wrong dates! I received amazingly convenient customer service from a gentlemen by the name of Jeren i believe, the guy changed my dates and made sure i was able to get in to my cabin the same day. He made my experience that much more enjoyable and had such a laid back personality, led me to believe he may not understand just how helpful he was. To top it off my sister that i was visiting there, left her Tiffany necklace on check out day and one of the customer service reps gave me a call that it was found and allowed her to pick it up!! I would recommend World Class Property Management to every and anybody!! We are glad that you enjoyed your stay with us. We hope to see you again. Nice place, but in need of some TLC.Dishwasher did not work properly, so had to do all dishes by hand. Very squeaky upstairs bed. Shower upstairs impossible for anyone over 4 feet. Cabin in the woods. 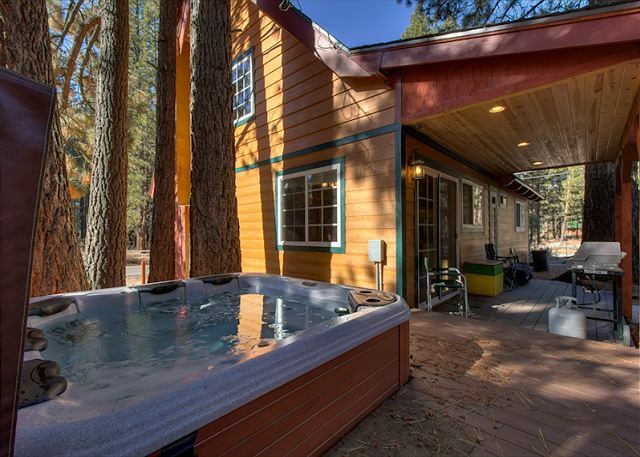 Everyone loved the hot tub, the cabin feel of the house, pool table, kitchen was great. For the most part, our stay was pleasant, but there were a few minor issues. When we arrived we were met with an overwhelming odor of pinesol, so strong that we had to open all the windows. Additionally the floors were not clean, as evidenced by my white socks turning brown after walking around the kitchen. The upstairs was very warm in the afternoon and the upstairsquerril bed was not comfortable. Lastly the televisions upstairs are not connected to cable and the one in the pool room has no dvd player, so it's of no use. All in all its a nice house, close to everything and very peaceful. This rental was very nice. It had a few disappointments. One was the lack of cooking utensils, and cooking pots. The dryer was old and did not dry cloths. Our bath towels that were on our bed in each room when we arrived were damp and had to be put in the dryer. But over all we had a great time with family and it is a very nice cabin. In the summer I would recommend a fan or ceiling fan for the up stairs bedroom because it was very hot a night and you could not open the French doors because it did not have a screen in it. Highly enjoyed our stay. There were 6 of us staying in the house. We had all the essentials of a home which we really liked especially the pool table. Everything was cozy. I'd definitely come here again. The location and overall upkeep of the home was well in line for the price of $200/night. 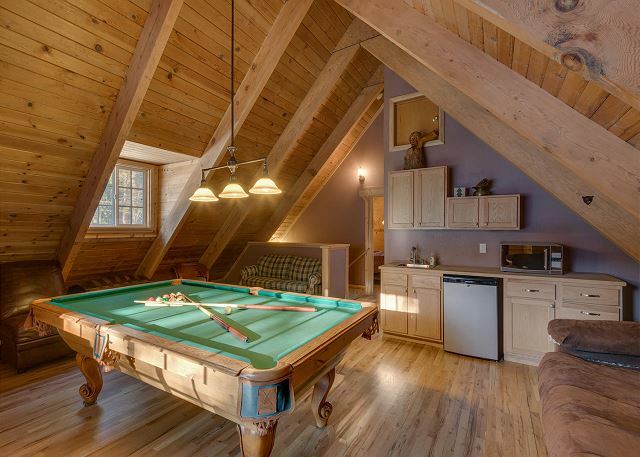 My teens loved the loft with pool table even though most of the ques were unusable. Hubby loved the hot tub. The upgrades it did have were nice. Wish the kitchen was less of a Hodge podge of items and more useful sets. Overall a clean and nice quiet getaway. The cabin was cute and cozy. The kitchen had everything we needed to cook with. The pole table room was huge with plenty of seating, refrigerator, and coffee maker. The only gripe was the dinning room. It was a little small for 8 people. Also, if you are picking this cabin for the hot tub, make sure you contact someone beforehand to unlock it and to make sure it works. We have to keep the hot tub locked. The code for it is in your final confirmation, it is also serviced before every renter. Thank you and we hope to see you again in Tahoe. My family and I enjoyed our stay here as there was more than enough space for all of us. The house is in a good location, not far at all from the main resorts, restaurants, and shops. The place also included all the basic things we needed and the kitchen is pretty well equipped to cook your meals. Bonus that it had a washer and dryer inside so we were able to wash all our snow gear. The only down side is that upstairs is pretty cold even with the heater on. We found that we had to close a couple of the downstairs vents in order for the heat to make its way up. Also, I wish the big sliding door in the dining area had blinds! The entire kitchen/dining area and some of the living room space just seemed out in the open for outsiders to see in which made it a bit creepy at night. The upstairs bedroom also needs blinds on the double doors out to the balcony. Another down side to the house is that my mom saw a spirit of a little boy there. However, he didn't bother anyone and he was more attracted to the kids playing. It made us a little uneasy but overall we had a good stay! Than you for your review. I will suggest to the owner about the heat and the blinds. The decor in the home is very fitting to Tahoe. We really felt like we were vacationing in the woods. The management company, Jeren, was so very nice to deal with. We will be back. Thank you for a great time. Daniel C does not recommend this vacation rental. Great for a one time Christmas family gathering for that cabin Thomas Kinkaid feel. The woods in the front of the cabin is beautiful. This is a must do once in a lifetime for your kids, but wouldn't do it again. We are going back to 4 star hotel next time. All the beds are cheap and hard to sleep on. The sofa was most comfortable than the beds. Hot tub temp will not rise above luke warm, so not hot enough to enjoy, so we brought swim wears for nothing. The billard table is nice but the pool sticks have either broken tips or crooked; Only 1 or 2 decent stick are useful. Upstair shower head fell down during one shower. The heat from the heater was distributed strangely; the bunk bed room was so hot that kids slept in drenched sweat, and the bathroom's are like saunas. While our trash piled up, for the 9 days we stayed, there was not trash service to clear out the outdoor bear proofed trash bin. So we had to store our bags of trash in the kitchen because we were told outdoors have bears. To enjoy the cabin, you have to ignore the details and just focus on the cabin vibe & the atmosphere. Sorry about those items. You never called us during your stay, we could have has someone look at the hot tub. Most of the time it is due to the renter raising the temp so high that it shuts off. a guest from san diego, ca does not recommend this vacation rental. we arrived this property at 9pm. there were broken glass of wine when we just entered the property. everyone who rent this property sign 5 pages of contraction. after we saw this broken glass, i cantact the management right away. but they respond that they already shcked that morning and that is not possible like we broke that glass of wine or something. without saying sorry, they yelled at us they are not gonna charge for the glass and hung up on me! second night we saw 3 mice at the kitchen! I contact the management but they asked me did you really see it and saying that they never saw mice on this property like i was lying. my husband killed one of the mouse so i took pix and send that pix to them. then they were saying that all of these houses at the mountain has mice, and fianlly came in and place the traps. i know that the mice broke that wine glass. on third day we wanted to do hot tube so we went in. but hot tube water was not hot so we contact them again, and they were saying that we splashed the water out like we did something to it. and next day they came to check. even they placed some traps, we stayed with mice for whole week because i saw the mice on the last day of my trip. everythin can happened BUT this manager's attitude and respond is not right. mirror and door handle in the bathroom was falling off. and not cleaned. this property and managent was NOT ready to rent. It is not world class! i do not recomand this property and this management. Sorry you had such a bad experience. 1. You called to let us know there was ONE broken wine glass on the counter... we put wine glasses on the counters as decoration for our renters.... The wine glass was NOT broken 4 hours earlier in the day when we checked on the property. It is very possible that wind from shutting the door behind us after checking on the house had knocked over the glass. We told you this over the phone and let you know that is was no ones fault and there would be no charge from that. And we did not hang up on you, we got disconnected. 2. When you called and told us there was a mice in the house we sent someone over right away. You have to understand that we live in the mountains and animals do get into the houses once in a while and we always respond to fixing that if it happens. 3. We also sent someone over right away when the door handle fell off the bathroom door. 4. The hot tub was serviced the day you checked in... the water level had gotten so low during your stay that it was not going through the filter to heat it up. We also fixed that right away. Again we are sorry that you had a bad experience. Great cabin and great experience!! We all enjoyed are stay and have no complaints about the size and set up. Unfortunately, the fridge wasn't working the first night and we had to throw out a decent amount of food. Other then that, everything went smoothly and we would definitely consider coming back for another stay. GARY D does not recommend this vacation rental. My boyfriend was visiting from England and I wanted him to visit Lake Tahoe to get the same magical effect that I got the first time that I visited there. This property just added to the ambiance of Lake Tahoe and it was, by far, one of the most amazing places that I had ever stayed in and it was absolutely gorgeous. We had a great time. Thanks! We will be back again. The cabin is in a great location. A quiet neighborhood was a nice vacation. Exactly as advertised. Although the upstairs shower was a little tricky I knew that going in based in other reviews. So I have no personal complaints but wouldn't recommend the shower for someone who is not willing to work around its design. I would recommend a new grill as the one that is there seems past its prime. It took FOREVER to heat up, which seemed to be a gas flow issue. Once it was heated up it took awhile to cook, which was ok since we were with company. But for someone on a schedule it would be a hassle. Overall, we really enjoyed our stay and the neighborhood was centrally located to all of South Tahoe. We will be back! We rented this property for a staging/lodging place so we could ride in the "Americas most Beautiful Bike ride" around lake Tahoe. 5 guys, lots of cooks and lots of rest needed. It was perfect!!! Rental went great, everything was as expected. Very reasonable price for what you get. We were only told we would be provided with the first round of toiletries/paper towels/etc, but we were provided with at least 3 of each. a guest from DISCOVERY BAY, other does not recommend this vacation rental. Having rented before in South Lake Tahoe this was a disappointing rental. The Kitchen was well appointed with plenty of good appliances. There were plenty of clean towels and bedding around and the living room was fine. However, there wasn't really enough seating for 7 in the living area. Also the dining table only had seats for 4. When we arrived there had been a snow storm and we had to guess where the drive was to park the car - the drive and paths were cleared the following day however. The shower upstairs was ridiculous! If you were over 4foot tall you couldn't stand under it and kept banging your head on the beam. No hanging space in any of the wardrobes (no rail or hangers) which meant we spent the whole week living out of suitcases which was frustrating. There was no blind or curtain over the large glass doors in the bedroom upstairs, this meant the morning light came in and also it was a bit unnerving getting undressed even given the remote location. The heating system didn't seem very efficient. We were able to heat downstairs no problem, but to get warm upstairs we had to turn the temperature up so far we boiled the downstairs! Great Place to Stay on New Years! Friends and I stayed on New Years and had a great time! The house was not missing a thing when we arrived and was very clean. The location was also very quiet (There is a concert that is held nearby Dec 29-31 but the music is not too loud at the house and the concerts end by 11pm each night). Overall, a perfect South Lake Tahoe experience! There were a few items that were not inorder but there were enough tools in the house to permit us to correct ie the shower heads. There were a number of outlets that were not funtional or which required rearranging to permit the bedside lamps to remain on when the over heads were turned off. Over all there were no major complaints. Booking was easy and the cabin was very well described online. The area felt remote and was generally quiet, but it only took 5 minutes to get to the main road and many activities. We cooked a few meals and found everything we needed in the kitchen. Appliances were newer and worked great. 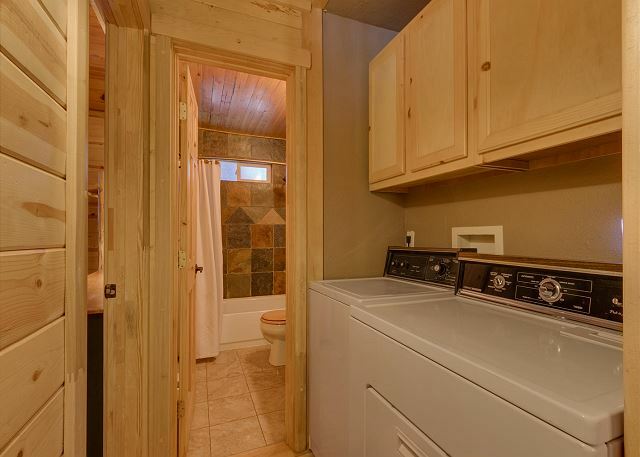 The cabin was well stocked with clean linens and towels. Overall, the home is very well kept and our stay was relaxing. A few minor issues, (a) the stereo was not working (b) no instructions for the hot tub, so we pressed buttons and eventually figured it out (c) the upstairs shower is very hard to use if you're over 4' tall. And now for some "above and beyond" items...The home is well heated and very comfortable; there were wine glasses and coffee mugs set out for us upon arrival; and the kitchen was set up with a new sponge and fresh dish towels for our use. These were some very nice touches that we don't usually see when renting a home. We would certainly rent this home again in the future. We are glad to see that you enjoyed your vacation here in Tahoe. We look forward to you renting from us again. Lovely cabin- cozy and clean. Upstairs was very cold at night. We had an awesome time! We particularly loved the beauty of the fireplace and kitchen. Our party spent some quality time in the hot tub and playing pool. My only concern was the upstairs shower. The beam in the center made it uncomfortable, to say the least, and I could not get the shower head to work, so I used the hand-held wand to get clean. Not ideal, but it worked in a pinch. We loved everything else so much that we want to come back next year. This place was perfect for a group of 8 people. Everything was pretty much as advertised. I can see the issue with the neighbor. We were playing cards in the kitchen, and he just approached glass backdoor and said he was good friends with the neighbor and wanted to come in and show someone the place who was thinking about renting it out. I really didn't mind, but I would have rather went the weekend without a request like that. He was nice though. With our family of 5 (3 kids, 2 adults) we had a great stay at the Elkhorn Lodge during the summer period. It is well situated for making day trips to all that lake Tahoe has to offer. The lodge is new and well maintained. It is spacious and especialy the top floor with pool table etc. offers kids a perfect place to chill in the evening. Only "area of improvement" is the back porch and back yard which was a mess when we stayed there. Glad that you enjoyed your vacation here in Tahoe. The owner is working on improvements in the back yard. We look forward to you renting from us again. I travelled from Canada with my husband, teenage daughter, and preteen son and all four of us had an amazing time. The home was perfect for us. We each had our own space but it was cozy enough to spend time together too. Very clean and inviting. Highly recommended! All the bath towels were still damp when they were put away and you didn't realize it until you were getting out. Everything else was great! We (my family of 5) thought this was a great rental, especially given the reasonable price for it. The location was good - right in the middle of town (no view though). The house is on a decent-sized lot on the corner, and the house's size inside was generous for our family. The only criticism (which is minor) is that we spent too much time at the front end of our stay finding things in need of repair and, due to the rental contract language, having to make a couple calls to the property management company to explain to them what we found (e.g., broken lamp here, scratch marks there, etc.). Also, we found it odd that wash cloths in both the kitchen and the baths were not provided. We called to inquire about these, and were told that the owners chose not to provide these items!? Other than these minor things, it was a great place to stay. Every one Loved it ! Pictures and words can't describe how Great this cabin is . Called /emailed patty she answered all my questions and helped me all the way, rite there i knew it was going to be great.The cabine is New and very comfortable.Location is perfect very nice woods on two sides and neighbors are Pefect talked to everyone feels like home.Everyone in our party respected this cabin .I would book this cabin in a heart beat ! Thanks to everyone who built it and patty ! Great Tahoe cabin feel and location for fun. We rented the Elkhorn Lodge for two stays (5 days and 7 days) during the winter for skiing, family of four, plus our 9 pound Maltipoo. Location and neighborhood are great, minutes from Heavenly, shopping, and great for walking our dog. 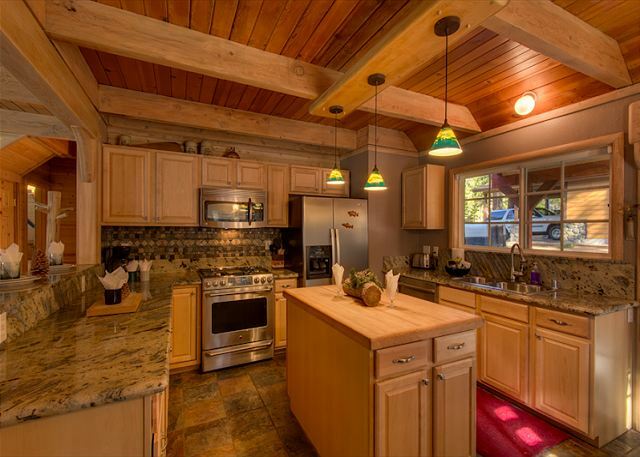 Lodge has a great Tahoe cabin feel with quality wood interior features, very functional kitchen, and space to sleep 8. Pool table/game room and hot tub big plus for relaxing after day of skiing. Internet, TV/DVD, and off street parking also great. What helped make this experience even better was the property management company worked with us. We had to shift our schedule due to our daughter’s swim meet. They worked with us and made it work out with no extra cost! Also, when we asked about getting some more lights for the main area, they fixed it immediately. They were open to us having our Maltipoo stay at the home, which was a must for my wife and kids. Will be renting this in the future for summer and winter vacations. Very glad you and your family enjoyed the cabin. Look forward to you renting from us again. I want to stay in this cabin again! The house was beautiful, the location was near Heavenly, and everything on-site was pretty much perfect. My only complaint would have been about the management company before we got there. This is the first house I ever rented, and they never actually sent me the rental agreement to sign. I called to ask about it, and my call got sent straight to voicemail twice. Then when I left a message asking what the next step in the process was, I got a pretty rude call back almost immediately from someone who didn't seem to believe that I didn't get the rental agreement in the email. That said, I did call around 7 on a Friday... so it was at the end of the week, and they were probably officially 'off the clock' at the time. And despite the uncomfortable conversation, they sent me the rental agreement almost immediately, and I had no problems with them after that at all. Overall it was an excellent purchase, and I'd highly recommend it to anyone looking to check out South Tahoe. a guest from San jose, CA does not recommend this vacation rental. We definitely enjoyed our stay in this modern and comfy cabin. It is nicely decorated throughout and had everything we could possibly need and more. We enjoyed cooking in the beautiful and fully stocked kitchen. The pool table/game room provided hours of fun. We also enjoyed the hot tub and the fact that is literally just a few steps outside. This awesome property has amazing views and is conveniently located to all the fun and excitement. I know we will definitely return to this cabin and can highly recommend it to our friends and family! Looking through the cabin photo online. i was afraid the photo made it look way better then it suppose to be. However i booked it anyways because they offer a great price after 1.5 hr of online searching and comparing. The charming cabin was located in a good quite location. Our neighbor around us wasn't around. It was just how i expected it to be like. It was a little smaller but it was cozy and well kept. Kitchen was fully loaded with appliances. I love the fire place, pool table and of course the jacuzzi. I will definitely recommend this place and will definitely come back if they offer a good price again. Just as advertised- A great place to stay in Tahoe! We thought that this home was absolutely the best we've rented for the money. The heating system was a little out of balance for upstairs but other than that, we were impressed and very content. The owners should be commended for the quality of this home. Everything was great but the heat would come out cold from the vent in the billiards room.